A row of working street lights helps complete any city scene. Lamps with grain-of-wheat bulbs are too delicate and burn out too easily and quickly. Plastic lampposts break easily with a wave of a hand. And many commercial models are just really too expensive. 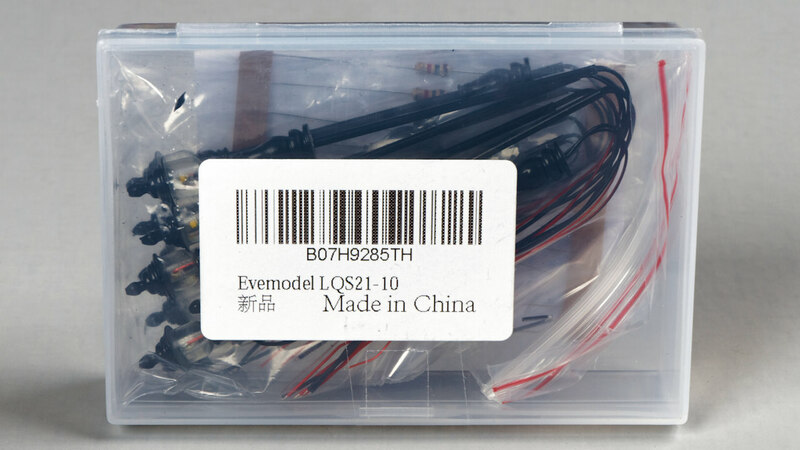 The Evemodel LQS21 lampposts solve all of these problems. For $14.99 (the price for one or two in some other brands) you get ten street lights. The built-in LEDs have a great warm white color with all the advantages LEDs bring: very long life, no heat, and low power requirements. 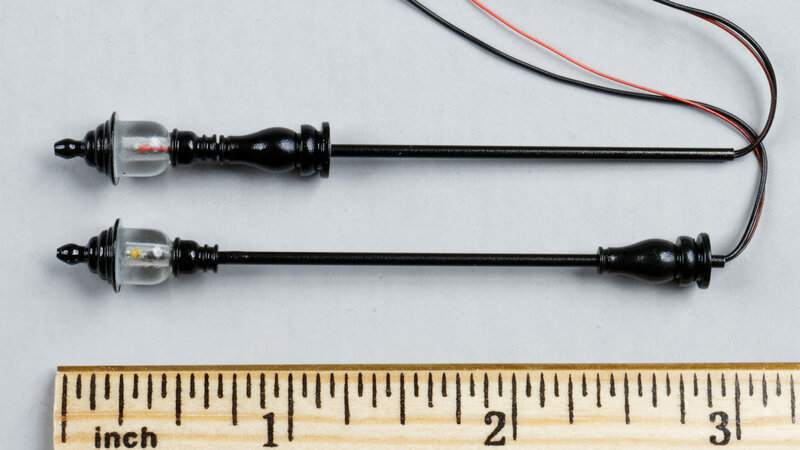 They are constructed with a hard-to-damage metal tube for the post. And they look nice. All for $1.50 a lamppost! 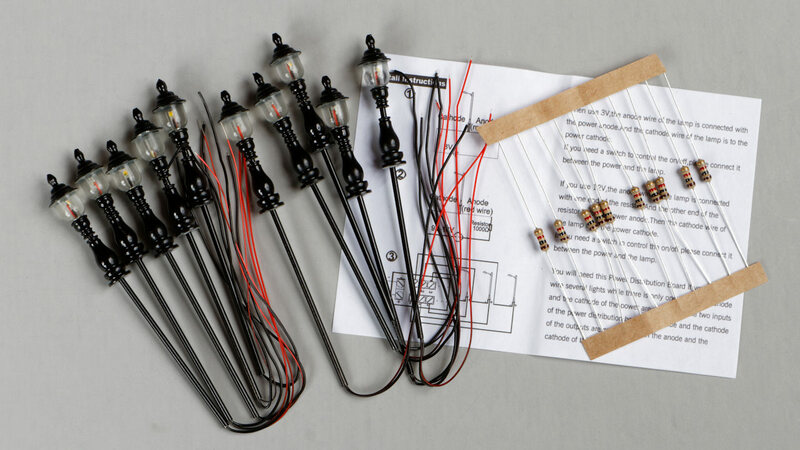 The package includes ten street lights, ten resistors (if you want to use a 9 to 16 volt power supply), and an instruction sheet. The LED is installed in a clear globe at one end of the metal tube with a decorative finial on top and a supporting collar at the bottom of the globe. The street light’s height can be adjusted by sliding the base up and down on the tube. When you have the street light at the height you want, a drop of glue (I used Elmer’s clear glue) at the bottom of the base holds it in place. The maximum height is just under three inches. Two fine wires are used for the electrical connection. They are marked red and black for polarity. The height of the street light can be adjusted by sliding the lamp base on the post. The maximum height is about 3 inches. The LEDs use 20ma of power and operate at 3 volts. The black wire is the LED’s cathode and the red wire is the anode. I lit mine with a 3-volt “wall wart” power adapter I own. That way I didn’t need to use any resistors. Resistors are included if you want to use a 9 to 16 volt power supply instead. In that case one resistor is added to each street light. This is also explained in the instructions that come with the lights. The Evemodel lampposts have a traditional black finish and will work in any cityscape or park scene. 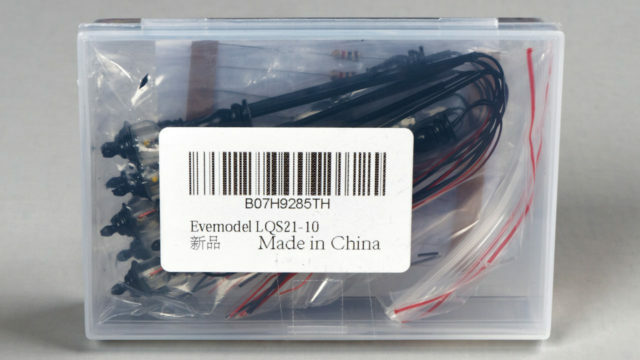 The Evemodel street lights arrived in a plastic bag inside a small plastic box. Thank you Richard for sharing this very interesting article. Very well done. I am very interested in these lamp post lights. I just have one question: Are these lamps HO scale? They look like they are, but can’t tell from the pictures. Yes, they are HO scale. 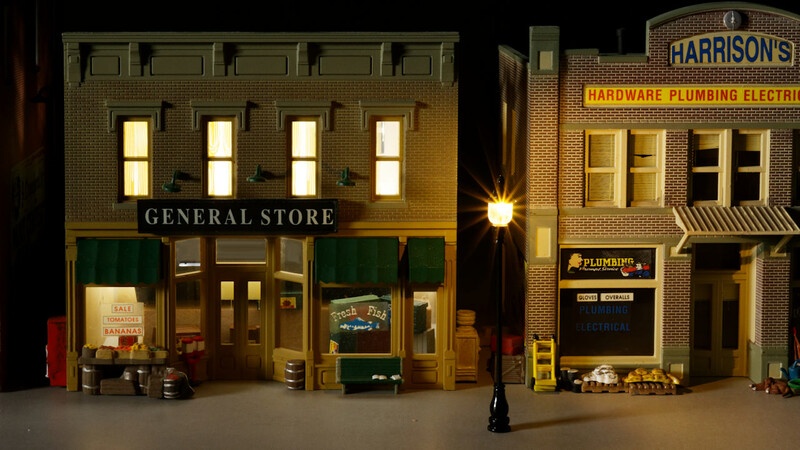 The buildings and figures I photographed them with are HO scale as well.